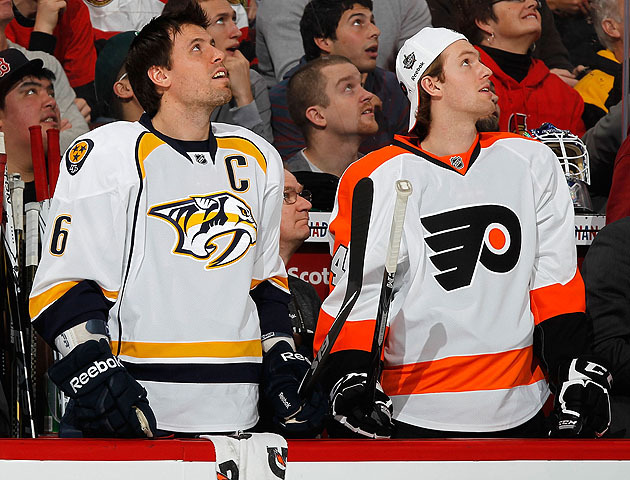 Shea Weber inks 14-year offer sheet with Philadelphia Flyers; will Predators match? I think Shea Weber is 1000 x’s better than Ryan Suter, so this will be a great deal if the Predator’s don’t match the offer sheet. The Philadelphia Flyers and Nashville Predators star defenseman Shea Weber have agreed to a 14-year offer sheet “upwards of $100 million,” giving Nashville GM David Poile a week to match the contract terms. The news was first reported by TSN’s Darren Dreger. Weber, 26, made $7.5 million last season with the Predators. Poile had said repeatedly that the Predators would match any offer for Weber; but if a trade was in the works with the Flyers or any other NHL team, does that indicate Nashville’s officially out on Weber? The ‪Preds‬ have said they would match an offer sheet to Weber in the past. This depends on the up front money. “Up front” as in signing bonuses. Keep in mind Ryan Suter received $25 million in bonuses over the first three years of his deal. Depending on what Weber’s cap hit would be, the Predators should receive four first-round picks. The Flyers own their first-round picks for at least the next two drafts, with the 2014 NHL Draft scheduled for Philadelphia. The Flyers currently have $28.42 million committed against the cap to eight defenseman, which includes Chris Pronger‘s $4,921,429 cap hit that will be relegated to long-term injured reserve. For Weber, it was an interesting call: Signing a deal now that could be susceptible to a salary rollback (his rather large signing bonuses would be protected), or waiting until a new CBA is settled, running the risk that term limits will be a part of the new rules. So he opted for the term now, money lost in a rollback be damned. It’s also a genius move for Holmgren. Assuming Pronger’s done, the Flyers were looking at Kimmo Timonen with one year left on his deal at 37 years old; Braydon Coburn signed through 2016; Luke Schenn signed through 2016; and two more years of Andrej Meszaros. Weber is a game-changer if his deal goes through; an elite defenseman, a strong leader and an offensive force. The Eastern Conference has just witnessed a seismic shift in power. Broad Street Buzz wondered this week what the Flyers would give up for Weber. They may have landed one of the best defensemen in hockey without surrendering a single player from their roster via trade. As for the Predators fans … your heart goes out to them if they don’t match. Ryan Suter leaves to play with Zach Parise and chase an incredible amount of money. Weber feels betrayed and disenchanted by the whole thing, and decides his time in Nashville is over. Two of the reasons why that town transformed into hockey-mad ‘burgh, gone in a span of weeks. Brutal.